Hello! It's my favorite time of the week again - Wednesday! 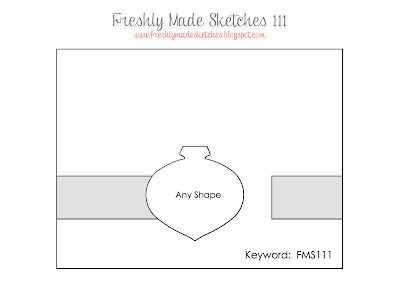 And at Freshly Made Sketches Linda Callahan has blessed us with an awesome new sketch. LOVE it! Well, it's been a bit quiet on my blog-o the past couple of weeks. I was off on a little vacation visiting with my sister and crafting up a christmas card storm (I made 36 cards and she made twice that many!). Then when I got back, before I could get back into the swing of things, I caught a cold. I'm pretty sure I caught it from someone on the plane - Grrrr! It wasn't a terrible cold but enough to knock out my mojo for a few days. Be sure to stop by Freshly Made Sketches and check out the wonderful creations from the Clean Team! And please come and play. I'd love to see your take on Linda's sketch! That poinsettia is beautiful! LOVE! Sounds like you and your sister had a lovely time together stamping Linda! Your white poinsettia is beautiful! That die was worth waiting for! Beautiful poinsettia! And the extra bling in the middle is perfect! EEEK!!! That is my favorite Christmas die! And layering the flower in white looks absolutely stunning. Then you went and added the green leaves and orange glitter paper and I just about swooned! One pretty card Linda!! 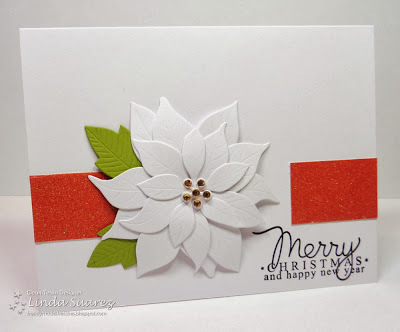 I am loooving the white poinsettia!! Linda this is so gorgeous, I love all the white! Linda, this card is just amazing! I love that poinsettia! It's just beautiful! Wow! This to me is the perfect Christmas card! This is a stunner, Linda! I love that white flower, and that die is just gorgeous. This little gem you whipped up Linda is simply stunning! I'm loving that poinsettia too! This is beautiful Linda, Love it!!!! This is gorgeous, Linda, just gorgeous! Oh my gosh! I love the poinsettia dies! And it is sooooo pretty in white. Gorgeous card, Linda! Wow. Those flower is STUNNING! Such a gorgeous focal point in white!